Collaborating is a powerful feature of QuantConnect which allows up to 10 team members to work on a project at the same time. This can be useful when a team of specialists collaborates to build a great strategy. The project creator holds the master copy of the project and can add team members and control the project permissions. To add a team member you just click the “Share” button in the project tab and search for the user by name or email address. 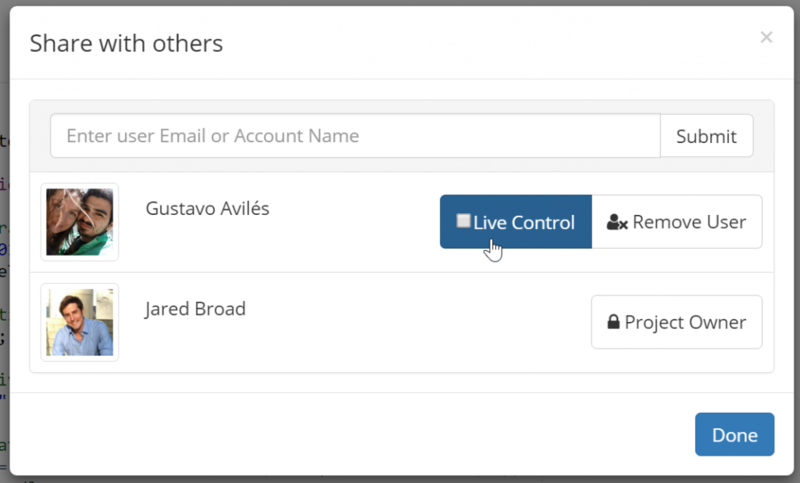 Once the user is added you can control their permissions or remove them from the project. Changes to shared projects are instantly shared between the collaborators and can be see by the colorful cursor representing the other team members.